True Audiophile: What is WRONG with my SYSTEM!! There's so much STATIC!!! What is WRONG with my SYSTEM!! There's so much STATIC!!! We get this kind of static all the time. Especially in the winter months when its typical for a TT to generate static in dry heated air. That 'slurp' you hear when you turn over your record is not good. It'll swamp the stylus and eventully your entire table. Aside from getting a humidifier (which we strongly recommend for stereo rooms in the winter) there's still only one device that removes static. I guess that's why they call things classics. 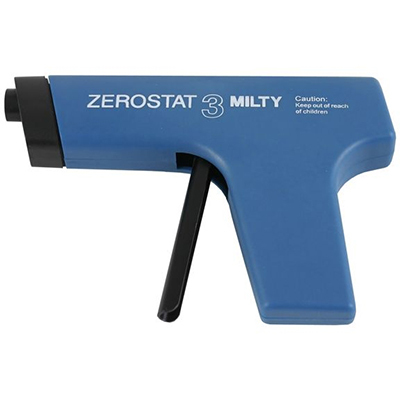 Zerostat is the way to go. Its been the way to go. So give up. Get one. Then go back to happy listening.